Located by the highly sought-after Historic Cathedral District! Charming 2-story COLONIAL with 3 bedrooms on one level, 2 bathrooms, fenced yard, sprinklers and a 2-CAR GARAGE. 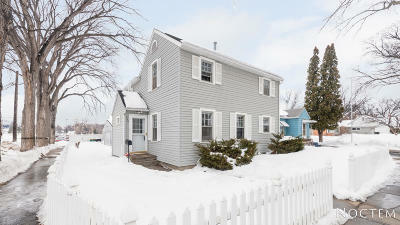 You'll love the white picket fence and the updated MAINTENANCE FREE STEEL SIDING on the house. Notice the arched doorway and stained glass window in the entrance. The kitchen has refaced white cabinets with new doors & drawer fronts and stainless steel appliances. There are hard surface floors and neutral carpets throughout along with many storage closets. The upper level offers three bedrooms and a full bathroom. Approximately half of the basement is finished for a small family room/rec room and has an additional heat source, plus laundry room with washer & dryer included. The other half is unfinished, excellent for hobbies, storage, den, playroom. The breaker box has been updated plus there was a new 40-gallon water heater installed in 2009 and HE furnace & a/c unit in 2010.